A depiction of an arrested person holding a large quantity of U.S. currency. Photo: Shutterstock.com, all rights reserved. The City of Boston settled a lawsuit recently filed by Simon Glik, an attorney who was arrested in 2007 as he recorded police using force to subdue another man. The settlement total came to $170,000, according to the American Civil Liberties Union (ACLU) of Massachusetts, which represented Glik in the case. He was initially charged with a felony, under laws meant to ban illegal wiretapping, but the charge was dismissed. The city has since initiated a training program for officers that teaches them to ignore individuals who film their activities in public. The two arresting officers in Glik’s case were also disciplined. Glik isn’t the only American to face arrest for recording police officers in public. Others have been taken into custody in states like Florida and Illinois. A federal jury in Oregon, as well, awarded minor damages to a man who was arrested for filming an officer in 2009. Good on the recording, BAD on the reward. Too damn high! Instead they should offer this guy a job in enforcement and sack the worst in the police. Giving away 170K is so very wrong when a 401K is considered a retirement. This quantum of payment could lead to abuse of the system where staged abuse cases which are colluded on for exposure with so-called whistleblowers to defraud the tax payers of funds possibly splittingthe payout later on. Do a second investigation and end this pay-out practice at once. At most award what a journalist (not the plutocrat type journos) could get for any special ‘scoop’. 170K is s sign of corruption somewhere. The system is being tweaked to ‘feel good’ but still the THEFT continues, but in different form. 170K of taxpayer’s funds are excessive and corrupt! His reputation for living dangerously has followed him since his retirement from the NBA. But former basketball star Dennis Rodman is now ‘broke’ and ‘extremely sick’, according to his lawyer. Attorney Linnea Willis says the 50-year-old is suffering from alcoholism and is barely able to cover his living expenses, as he fights off claims the Hall of Fame player owes nearly $1million in child and spousal support. Rodman faces up to 20 days in jail for missed payments. Court documents obtained by The Daily Record show as of March 1 Rodman owed $808,935 in child support for his nine- and ten-year-old children. Rodman also owed $51,441 through March 1 in back spousal support, Jack Kayajanian, attorney for his ex-wife, Michelle Moyer, claims in the filings. The news outlet reports Michelle Rodman is identified in the documents as a Costa Mesa, California resident. She is also requesting attorneys’ fees. But the former athlete’s attorney says it’s unreasonable to expect Rodman can afford the $5,000 he has for one child from another relationship; and the $4,500 monthly payment for spousal and child support to Michelle Rodman. ‘Respondent Dennis Rodman is broke and cannot afford any additional fees,’ Mr Willis writes in filings on his behalf, adding that he is ‘extremely sick’. ‘…And in all honesty, Dennis, although a very sweet person, is an alcoholic,’ Mr Willis writes. ‘His sickness impacts his ability to get work. This case, especially his wife filling for divorce, has put him on a binge that I have never seen before. He is extremely hurt and extremely sick. He is often unable to obtain work because of this sickness. And his sickness is getting increasingly worse. ‘Dennis cannot afford his own monthly expenses. If the court awards attorney fees, it is setting Dennis up to be in contempt because you cannot get blood from a turnip,’ Mr Willis contends. The attorney says those who have represented Rodman to date have worked pro bono. Mr Willis claims Rodman this year has paid more in child support than he’s earned; and that he has only been able to pay by borrowing money from his finance manager, Peggy Williams, and his agent, Darren Prince, according to The Daily Record. Mr Willis claims Rodman has made $8,000 this year, a staggering difference from the $570,000 in earnings he claimed at the time his wife filed for divorce. The former couple married in 2003 on Rodman’s 42nd birthday, settling in Newport beach, California. According to a Los Angeles Times article published in 2004, Rodman listed his monthly expenses then as more than $30,000. Michelle Rodman listed her monthly expenses as $17,000. But in 2008 police were called to a domestic violence incident at a Los Angeles hotel. Rodman pleaded no contest to a misdemeanor spousal battery charges and was sentenced to one year of domestic violence counselling and three years probation. He received 45 hours of community service. Rodman later entered rehab for treatment for drug abuse, and appeared on Celebrity Rehab. The reality television stint came long after Rodman retired from NBA basketball in the 1999-2000 season after a 14-year career, known then as one of the most revered rebounders in the NBA. Rodman is scheduled for a court hearing in Orange County, California on Tuesday. The discrepancy over his spousal and child support payments are not his only financial woes, however. The Daily Record reports Rodman owes more than $350,000 in back taxes, which Mr Willis says were calculated incorrectly by a former accountant. He claims his client owes about $100,000. “His sickness impacts his ability to get work. This case, especially his wife filling for divorce, has put him on a binge that I have never seen before. He is extremely hurt and extremely sick. He is often unable to obtain work because of this sickness. And his sickness is getting increasingly worse”================ In other words he is a pathetic weakling who chooses to pour alcohol down his throat instead of manning up and looking after the children he created. Then has the nerve to present his weakness as “sickness”. Sickness is something like cancer – not overdoing the sauce, which is alcohol addiction, which is behavioural, not a disease. He is an alcoholic. That says it all.The court should force him into a rehab program to get him clean and sober. If he was sober he could earn money doing odd jobs in Holly Wood and Las Vegas. Putting him in jail won’t help anything. I’m sorry but what kind of lifestyle is his ex-wife and kids living to be owed that much money? I know he is a bit of an idiot to waste his cash on nonsense and at the time he had alot of money when the ex-wife’s claims were made but surely he should be paying somthing that is reasonable enough for them to live a decent comfortable life. Sounds like they bled him dry. He’s still an idiot though. A real shame. He is a good guy who got caught up in the showbiz lights. He was one of the best basketball players of all time and helped people like Jordan and Pipen shine, because he did all the dirty work. If anything, he was too generous and the party was always on him. Where are the good time “Friends” now when he needs some help ? I hope he lands on his feet and gets back on track. I had met him back in Canada when I was working. He is one of the discussion person I never met. I remember he did push a boy who had cancer because the recognize him and he did ask him an autograph. He throw in my face some paper. He was steeling food in the fridge we had to put locker on them during the night to stop him. Already then he was drinking a lot. I just remember that experience was really bad. He on my list of the worst clients I never had! Just another fool who threw away millions of dollars. No sympathy here. What a shock. Never saw this train wreck coming, did we? Jeremy Lin: Save your money. If the solution for bankruptcy of an individual is to jail at 40+K a year on the taxpayer’s back, then the West won’t need any enemies. Instead of a honmeless person costing nothing on the street, the taxpayers get to pay for this persons’ food and lodging for as many years as the Judge decides. Leave the West alone long enough (heck do trade sanctions and the West could immediately collapse from supporting prisoners alone . . . ) and the West will bankrupt themselves on ‘criminals’ sleeping and eating and being housed under the idiot ‘prison contractor enriching’ system (guess who’s relatives are the cronies) thanks to inpplicable and unreasanable laws. Looks like the Soviet Cold War Era all over again, except this time the world isn’t going to allow any colonialism or proxy wars anymore, with Human Rights secure nations immune in any case. The Middle East looks like the last frontier and even then, those regions are increasingly peopled by eduicated people who will not tolerate any foreign incursions anymore. Palestine issue is the worst sideshow of course . . . such a small region of the world will not hold hostage 192 countries. He is one of the most influential men in the Conservative Party. Yet he never gives interviews, has never stood for elected office, and is virtually unknown outside Westminster. There has never been a Tory Party chairman like Andrew Simon Feldman. He was given the job after the general election by David Cameron not because he has long political pedigree in the Conservative Party but for one reason only: he is Cameron’s closest friend. This perhaps explains why he is known among his increasing number of detractors on the Tory benches – detractors who want him sacked for his role in the cash-for-access scandal – as the ‘crony chairman’. When he was appointed there were inevitably arched eyebrows among the Tory faithful. It was not just that he had never been an MP or even a councillor but he also had none of the clout of his more illustrious predecessors such as Cecil Parkinson and Norman Tebbit. There was further unease when Cameron rewarded his friend with a peerage at the end of 2010. ‘What was it for, other than being Dave’s mate?’ asked one senior Tory figure pointedly last night. But, most controversially, he is the first Tory chairman to be given office space in 10 Downing Street. He meets party donors there, as and when he chooses, appearing to breach the Parliamentary rules which prohibits party political business from being conducted on government premises. Feldman, 46, is so intimately involved in the funding of the Tory Party that he was present at private dinners in the Downing Street flat when the Prime Minister was entertaining donors. ‘Cameron takes Feldman to all his donor meetings,’ said one senior Tory. Comparisons between Lord Feldman and Lord Levy – Tony Blair’s chief fundraiser, who was dubbed Lord Cashpoint after bringing in millions of pounds from wealthy businessmen – are inevitable. The irony is that money-raising is only one aspect of Lord Feldman’s role: another is to ensure that Cameron was never tainted, as Blair was, by rows over dodgy donations. Even his most loyal friends will now concede that he has failed spectacularly in that task. After all, it was Feldman who was responsible for the disastrous decision to bring in David Rowland, a multi-millionaire former tax exile who had been based in Guernsey for 40 years, as Tory treasurer in June 2010. Rowland’s business practices had attracted considerable criticism in the years before he was appointed, and he was denounced as a ‘shady’ financier in a Commons motion over one particular deal. He stood down just two months after he was appointed – and before he had even started the job – after the Daily Mail exposed the extent of his chequered business career and colourful private life. Feldman was also responsible for the even more catastrophic appointment of Peter Cruddas, who this week resigned in disgrace as treasurer after his boasts to undercover reporters about his ability to arrange access to the Prime Minister. Millionaire David Rowland pictured in London. He resigned as treasurer for the Conservative Party, before he even took up the position. Senior donors had themselves warned Feldman against appointing both men. But he simply ignored them because he was so desperate to find someone to do the job. So who is Lord Feldman of Elstree, and how has he become so close to the seat of power? Born into a well-off family, he went to Haberdashers’ Aske’s Boys’ School in Hertfordshire, where he won a place to study Law at Oxford. It was at Brasenose College, Oxford, that he met Cameron. They organised a college May ball together and discovered they had a mutual love of racquet sports (another similarity shared between tennis-playing Tony Blair and Lord Levy). Since those college days, the friendship has been cemented, with Cameron describing Feldman as ‘one of my oldest and best friends’. Like Cameron, Feldman got a First in his final exams; then he took a job with management consultants Bain & Co. before, in 1991, being called to the Bar and practising as a commercial barrister at one of the country’s top chambers. His family owns Jayroma, a multinational textile company making ladies’ clothes, and in 1995, aged 29, he joined the firm, drawing a salary of £900,000 in one year alone. It meant he was able to buy the £3million house in Holland Park, West London, where he lives with his wife Gaby and their three children round the corner from David Cameron’s house in Notting Hill. Tory figures describe Feldman as likeable, friendly, extremely bright and unassuming. He skis regularly, enjoys yoga, and owns another house in Andalusia, southern Spain. It was Feldman who not only urged Cameron to run for the Tory leadership as the dark horse candidate when Michael Howard announced that he was handing on the baton in 2005 after the party’s third successive general election defeat, but also masterminded his campaign. 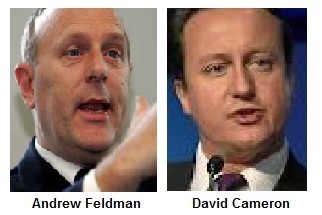 Feldman helped run Cameron’s bid with ruthless efficiency, calling in favours from his network of contacts in the business world and raising tens of thousands of pounds in the process. Through his family clothing firm, Feldman himself donated £10,000 to the successful cause. He was appointed deputy treasurer of the party in 2005, and – ironically given the circumstances today – immediately let it be known that he wanted to end the dependency on major donors such as Cruddas and Rowland. ‘He’s not comfortable with individuals giving large amounts. He wants a wider base of people giving smaller amounts,’ said a party official at the time. But even before the Conservatives got into power, Feldman made the wrong call. In 2007, he was chairman of the Leaders’ Club, a dining group for Tory donors who each gave a minimum £50,000 to party funds each year. They would have lunch or dinner in Mr Cameron’s office in the Commons and meet senior Tory politicians. But this arrangement was in breach of Parliament’s rules, which do not allow party-political fundraising in the House of Westminster, and Mr Cameron was forced to ‘unreservedly apologise’ after he was rebuked by the Parliamentary Commissioner for Standards, Sir Philip Mawer. In 2008, Lord Feldman was appointed chief executive of the Tory Party and was given specific responsibility for attracting party donors. Yet he blundered in the summer of 2009. With the then shadow chancellor George Osborne, they met the Russian oligarch Oleg Deripaska at billionaire financier Nat Rothschild’s luxury villa in Corfu, where a possible £50,000 donation was discussed. Donations from foreign nationals are illegal, although Feldman insists he was not soliciting money from Deripaska. He was made joint chairman of the Conservative Party with the Muslim peer Sayeeda Warsi after the 2010 election. Since then he has emerged as one of the key players in Cameron’s inner circle of advisers. When Cameron became Prime Minister, in his first Press conference with his deputy Nick Clegg, he pledged to end the old political culture where ‘tight-knit tribes make important decisions in wood-panelled rooms’. Allowing the Tory chairman to talk to party donors in the comfort of a Downing Street office, or in the kitchen of the flat above, hardly fits in with that firm commitment to clean up politics. Sir Alistair Graham, who was chairman of the Committee on Standards in Public Life which drew up the rules on party political funding, said Lord Feldman’s decision to hold meetings at No 10 is ‘entirely improper’. Isn’t this sort of post voted for (by the MPs at ‘Representative Democracy’ level very least, or at some kind of quorum based on London’s citizens ‘ True democracy’) and not installed by??? Amend the method of selection or prohibit installed posts. Very undemocratic. Also see below pic : Phenotype Favouritism, not much better than familial NEPOTISM. A ‘Spiritual Offence’ if anything, once formalized in the almost currently entirely corporeal code of law, this sort of selection (especially more so without vote) should be very apparent to all see those committing the act in the future. Dictators are narcissists. Lookalikes make the best cronies? Mirror mirror . . .
Britain will provide a further £500,000 to support Syria’s political opposition in the face of president Bashar Assad’s regime, the Foreign Secretary said. William Hague is expected to announce the extra funding tonight during his annual speech at the Lord Mayor’s Easter Banquet. Mr Hague said the money would help ‘hard-pressed’ opposition groups to document the regime’s violations. His announcement comes as Arab leaders at a regional summit in Iraq’s capital today endorsed a UN-backed peace plan for Syria which they said should be implemented ‘immediately and completely’. The six-point plan, drawn up by Kofi Annan, calls for the withdrawal of heavy weapons and troops from population centres, humanitarian assistance, the release of prisoners and free movement and access for journalists. Assad has promised he will do all he can to ensure Mr Annan’s plan succeeds but has demanded a pledge from his opponents to halt violence. In his speech, Mr Hague will set out that he has ‘agreed to provide a further half a million pounds of British support to Syria’s political opposition’. ‘It includes agreement in principle for practical non-lethal support to them inside Syria,’ Mr Hague said. The Government has, over the last eight months, given £450,000 of practical support to the Syrian opposition, including media skills training to internal activists and advice to Syrian human rights defenders. The support is intended to aid Syria’s political opposition groups to develop themselves as a credible alternative to Assad’s regime and develop the necessary capability to realise an orderly transition to a more democratic Syria. Britain sent an expert mission to the region last month to help document the atrocities that have taken place. Bashar Assad’s promise to do all he can to ensure the peace plan came as rebels carried out a string of bold attacks, killing two army colonels and kidnapping a high-ranking pilot. The president’s condition of an express promise from the opposition to stop attacks could complicate Mr Annan’s attempts to bring an end to more than a year of violence that the UN says has killed more than 9,000 people. The opposition has cautiously welcomed Annan’s six-point plan, which calls for Assad’s regime to implement a cease-fire. But the opposition is also deeply sceptical Assad will carry it out, believing he has accepted the plan just to win time while his forces continue their assault to crush the uprising. Armed rebels are unlikely to stop fighting unless offensives by security forces halt. In speeches at the Arab leaders’ annual summit in Iraq’s capital, Baghdad, yesterday, many made clear they felt the burden was on Assad’s regime to halt the fighting. ‘The Syrian government is required today to listen to the voice of reason and wisdom and stop all kinds of violence,’ the emir of Kuwait told the gathering. But he added that Mr Annan must also get a commitment from armed groups to cease their ‘terrorist acts’ against the government. Throughout the crisis, Assad’s regime has held that it faces not a popular uprising against his rule but a campaign of violence by terrorists. Syria’s uprising began a year ago with peaceful protests against Assad, which were met with a fierce crackdown by security forces. Since then, army defectors and protesters who took up weapons have formed militias, initially to protect protesters. But as the bloodshed rose, they turned to seizing pro-opposition neighbourhoods, towns and areas and launching attacks on government forces, usually raids on checkpoints or on army convoys. The new attacks today were particularly bold. In Aleppo, Syria’s largest city, gunmen opened fire on two army colonels in the central Bab al-Hadid roundabout, killing them. The state news agency Sana said the four attackers belonged to an ‘armed terrorist group’. Rebels also attacked an army truck and killed two soldiers in the central province of Hama, activists said. Fresh clashes also broke out between government troops and army defectors in the north and south, and activists said security forces reportedly killed at least 16 civilians across Syria, including a child and two women. Sana said authorities successfully liberated five military personnel who it said were kidnapped earlier by an ‘armed group’ in the northern province of Idlib. This has always been the strategy of the Tories give Billions away overseas of tax payers,aged pensioners money and allowances ect.In the hope that,overseas countries will buy from British manufactureing companies,so the Tory owners give big donations to the Tory Party. They cant chuck it away fast enough!! ‘To gain skills in democracy’, are these idiots in Westminster kidding. As for ‘democracy’, how about they get us out of the EU Dictatorship, that parasitic UNDEMOCRATIC blight on the UK, that we have undemocratically had foisted on us, and are being bled dry to fund. Oh, won’t you people in government ever learn? Wouldn’t you just love to line up every person in Parliament and shoot them? They are totally despicable and anti British. – The Fall of Britain and UKIP member, This government hasn’t a clue!, 30/3/2012 21:12 ______________________ CERTAINLY NOT!…… … The lady who hoovers the carpet at weekends is a lovely old soul…………….! So nice that the government has so much tax payers money to throw around, aide, welfare, the Soviet EU, it goes on and on. The taxes go up the borrowing continues. This ‘conservative government is just neoLabour, exactly what they do, tax, borrow waste and spend. Every party’s policy. Wouldn’t you just love to line up every person in Parliament and shoot them? They are totally despicable and anti British. Think how many pasties that would buy. Its a JOKE, Barmy Britian handing out aid to any one, anyhow, anyplace… What the heck is going on? ALL overseas aid should STOP NOW!! Plenty to be done HERE. Scraps of paper with lots of zeros is not real aid. If they sent food or blankets that would be more meaningful. Scholarships (indoctrination) are free as many people who can be squeezed into a room with a droning lecturer or repeating film. A machine prints those dollars on paper. Paper is worth not very much. 500K of nada is what was sent to Syria. That ‘scholarship’ (worth x days of seated rights in a lecture hall is for the Syrians). Please warm at our expense! Might as well watch some reality TV, less pretentious if propaganda is what this is all about. A slap in the face of the Syrians if anything. A bunch of leaflets on the UNHCR will do just fine. Why the 500K pretense? The English are not giving anything real. Foreign Affairs minister Luis Almagro said that the Uruguayan government does not oppose trade with the Falkland Islands and any undertaking to that effect by the private sector is welcome since “Uruguay does not agree with any commercial or economic blockade of the Islands”. “Supporting any form of blockade would be a violation of the Malvinas inhabitants’ human rights and the same we say with Cuba, we repeat in this case” said Almagro. The minister added that Uruguayan business people make business “with whom they wish and with whom they can…Uruguay, the administration of President (Jose) Mujica from the very first moment never said that a commercial blockade of the Islands was needed”. Nevertheless Uruguay supports Argentina’s sovereignty claim over the Falklands and recently co-sponsored a Mercosur resolution barring all Falklands’ flagged vessels from regional ports. Almagro’s statements come at a crucial moment for the government of President Mujica who is going through one of its worst moments in the bilateral relation with Argentina because of the continuous trade restrictions imposed by the administration of President Cristina Fernandez. President Mujica has encouraged his ministers and Uruguayan business people to search for new markets. The controversy about trade with the Falklands was born out of a piece from London’s The Sun saying that Uruguay ‘was breaking the trade embargo imposed on the Falklands by Argentina’, with a business delegation that will be flying to the Islands with a chartered aircraft next April 13. A group of 19 Uruguayan businessmen had already visited Falklands during February seeking for new opportunities mostly in the agribusiness area. Guillermo Wild, vice-president of the Uruguayan-British chamber of Commerce said the piece from The Sun was ‘confusing’. “Uruguay has traded with the Falklands continuously during 200 years. Trade was never interrupted and now we have a concrete problem with Argentina so any trade from Uruguay with the Falklands outstands and is motive of headlines for the English media”, said Wild. Furthermore “there is not such economic blockade as mentioned by The Sun. The only impediment is for vessels flying the Falklands flag to access Mercosur ports. Besides that any vessel and sail in and out of the Falklands”. “An air cargo company showed up at the Chamber and asked about the possibility of making a flight to the Falklands and consulted us on possible business contacts. What we did was to contact local businesses but so far no one has turned up”, revealed Wild. The vice-president of the Uruguay-Britain Chamber said the trade situation from Uruguay with the Falklands is “business as usual” with the only exception for Falklands flagged vessels, which was agreed at last December’s Mercosur summit and ‘sent the wrong message’. Try a limited blockade targeting only England and the Commonwealth nations (where the English Monarch is the head of that organisation – any countries choosing to drop out of Commonwealth can resume trade with Mercosur . . . ). Uruguay’s suggestion plays both sides as much as the above suggestion does. 30% (pro-West) /70% (pro-South American nations)! Should Uruguay concur with the above selective blockade suggestion, we’ll all be sure that Uruguay is on the right side of things.